In 2009, Hollywood Boulevard added another jewel to add to its tourist crown, literally alongside the stars' footprints at Grauman's Chinese Theatre, the Oscars' home at the Kodak Theatre, the El Capitan, and the giant Hollywood & Highland complex. 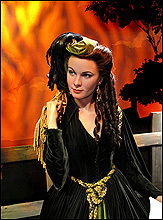 The new kid on the block, Madame Tussauds wax museum, is actually a very old and respected establishment, dating back to the 18th century, when Madame created and exhibited lifelike wax figures of the stars of her time, which included Benjamin Franklin and philosopher Voltaire. 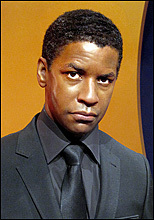 Today, this new branch of Madame Tussauds focuses almost exclusively on Hollywood stars, as befits its new location. 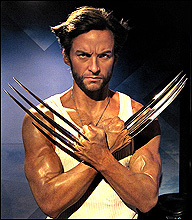 Tourists looking at the cement footprints of Hugh Jackman or Brad Pitt at Grauman's forecourt can now simply stroll a few yards west to rub elbows with life-size replicas of those same stars, many of them breathtakingly lifelike. 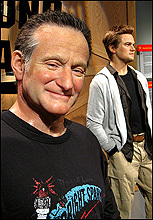 But there's little of that at Tussauds. 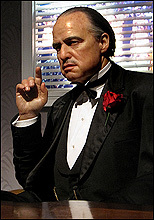 Here, the emphasis is almost exclusively on the wax figures themselves, as it should be. 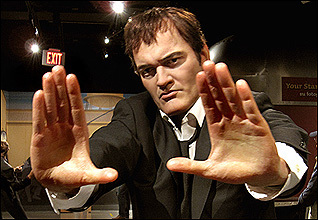 They are works of art in their own right, and Tussaud's layout allows you to get up close and personal, with nothing in the way between you and your favorite star. After you buy your ticket, and pass a good likeness of President Barack Obama (one of the few non-Hollywood figures on display here), an elevator whisks you up to the top (third) floor of the building, and you work your way down through a dozen rooms, each with a different theme. I arrived just after the museum opened, when the place was still uncrowded. When I walked into the first room, I saw what appeared to be a number of people standing around a large, mostly empty room. At first glance, I assumed they were other guests or employees. 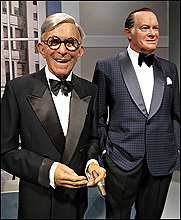 But after a moment, I realized that I was actually looking at wax figures, simply standing (or sitting) around the room, as if time had suddenly frozen still during an A-list cocktail party. And shooting photos is half the fun here. (Whatever you do, don't forget to bring your camera!) The photo-ops here are many, and come in both spontaneous and pre-planned forms. 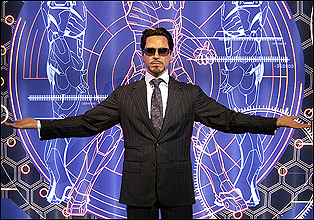 But there are also set-ups designed with photo-ops in mind. 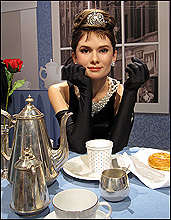 The figure of Audrey Hepburn, for instance,sits at a table straight out of her hit "Breakfast at Tiffany's" - and there is an empty chair next to her where you can sit down and have your photo taken as part of the scene. 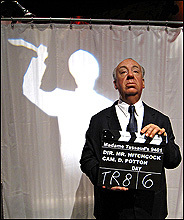 The figure of Alfred Hitchcock stands in front of a shower curtain (from the classic "Psycho"), and you can draw back that curtain to find a bathtub that can be used as a prop: stand in it and pretend to be slasher Norman Bates. There are even friendly props placed strategically near some figures to use in your photos (you'll find a top hat nearby Marlene Dietrich, if you want to strike a pose next to her). Other rooms feature Westerns (Clint Eastwood, John Wayne, Butch & Sundance), the Golden Age (Judy Garland, Fred & Ginger, Rhett & Scarlett), action heroes (Hugh Jackman as Wolverine, Jackie Chan), directors (Spielberg, Tarantino, Scorsese), sports (Kareem, Beckham, Tiger Woods), crime (the cast of "The Godfather", plus Hannibal Lecter himself), and an awards ceremony with Denzel and Halle Berry - to name just a few of the more than 100 figures on display here. The sets, though, are held to a minimum, often just a simple background recalling a particular film. As I mentioned before, the focus is on the stars. 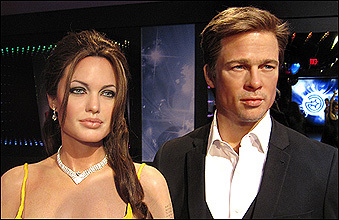 So, the obvious question is: how good are the wax figures themselves? I'm happy to report that, for the most part, the answer is: excellent. 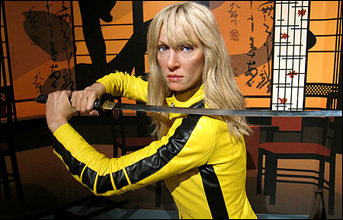 Madame Tussauds has a reputation for being the best in the business, and it shows. Most of the figures are dead-on. 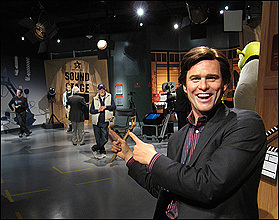 For many of the current stars, Tussauds actually brought the stars in and measured them, using computers, to make virtual clones of the celebs. Stars from the Golden Age of film, who are no longer with us to be measured, don't fare quite so well. The wax figure of Jimmy Stewart, for instance, looks a bit stiff as he poses near a sign reading "Bedford Falls". Jimmy lacks that happy twinkle we expect from the star of "It's a Wonderful Life". 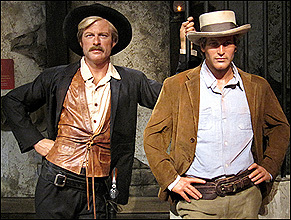 And John Wayne could be better, in my opinion. Among the modern stars, I thought that Tom Hanks figure could also have been more flattering. But that's nit-picking on my part. 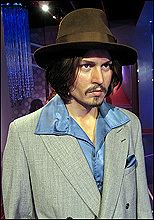 Over 90% of these wax celebs are simply wonderful, and the few that fall short of perfection are still certainly more than acceptable (something you couldn't always say about some of the figures at the old Movieland museum, or the generally dreadful Hollywood Wax Museum down the street). 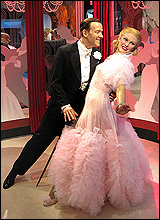 To return to the original comparison with Movieland (since that former attraction is what springs to mind for many Los Angelenos when you mention the words "wax museum"), while Tussaud's lacks some of the colorful sets found at Movieland, it more than makes up for it by the quality of the figures, and by the sheer, unbridled access they give visitors to their stars. It makes for a very up-close & personal experience. 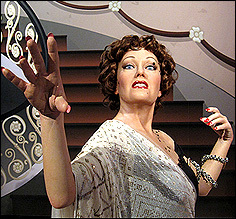 And speaking of parking, that brings me to my only unpleasant experience at Madame Tussauds. Normally, when you park in the garage under the Hollywood & Highland center, you pay just $2 after validation (as of 2009, that is). So, when I arrived and a friendly employee waved me into a parking entrance marked "Madame Tussaud's" (the first entrance north of Hollywood Blvd, on the west side of the center), I assumed parking rates would be the same. 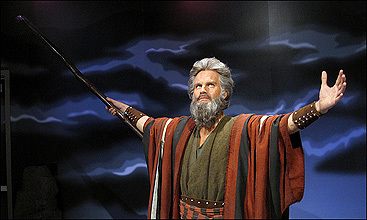 I forked over $10, assuming that $8 of it would be refunded as soon as I returned with proof that I had indeed bought a ticket to Tussauds. However, as it turns out, they don't validate for that section of the garage. I was forced to pay the full $10 for 90 minutes of parking. Considering that they charge a somewhat steep $25 admission price, gouging visitors for parking is a tacky move on the part of an otherwise well-ran operation. Stop it, guys. In the meanwhile, I strongly suggest that you drive right past that first entrance and pull into the regular Hollywood & Highland parking garage. Then get your ticket validated at the center's info booth or at one of their restaurants when you stop for lunch. Hours: Open daily, 10 AM to 8 PM (open until 10 PM during Summer season). 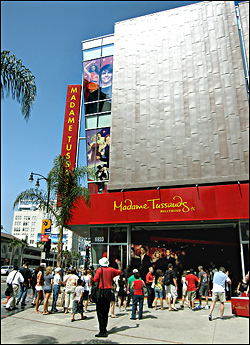 Getting there: Madame Tussaud's is right next to (west of) Grauman's Chinese Theatre, at the northeast corner of Hollywood Blvd & Orange Avenue. It is part of same block that houses the landmark Hollywood & Highland center, which includes both the Chinese and the Kodak Theatre, and is located at the west end of that complex. There is a MetroRail subway station directly under the Hollywood & Highland center, for those who prefer to use public transit.